Join us for a beloved Trinity tradition! Featuring all of the amazing musicians of Trinity alongside special guests, our 2018 Advent Concert Series promises to again delight, entertain, and inspire! 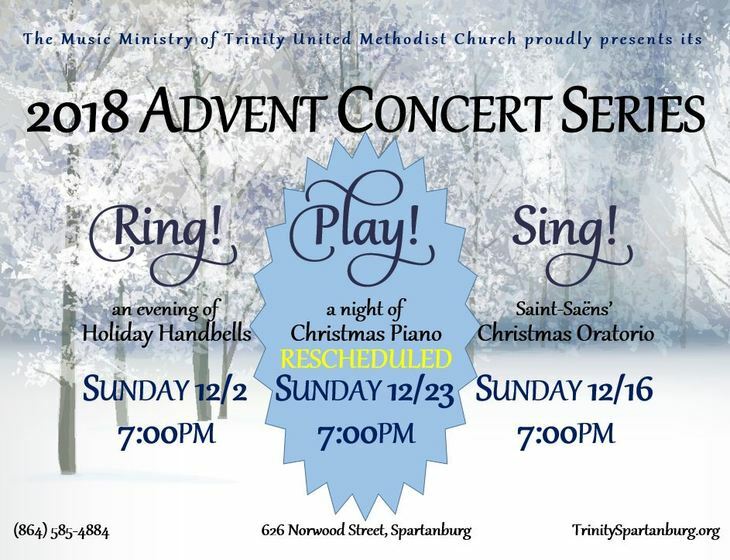 Join us in the sanctuary at 7:00pm; all concerts are free of charge and everyone is welcome! Light refreshments will be served following each event. Join us for the first event of our 2018 Advent Concert Series, when our three handbell ensembles combine forces for a fantastic night of holiday favorites! Join Trinity Bronze, Grace Notes quartet, and our children's Joyful Noise ringers for a fun, beautiful hour of bells, chimes, boomwhackers, and more! The second event of our 2018 Advent Concert Series: join us for what has become one of the most anticipated nights of Trinity's year! Director of Music, Ben Chumley, teams up with 4 of the most talented pianists in the Upstate for a tour de force concert of solos, duets, and dazzling 10-hand arrangements! A definite don't-miss! The final event of our 2018 Advent Concert Series: join our acclaimed Chancel Choir and special guests as we proudly present Camille Saint-Saëns' Christmas Oratorio! In honor of our upcoming tour of Canada, we will also present a selection of French Canadian carols, including the premiere of Director Ben Chumley's new arrangement of O Holy Night! The Chancel Choir will be joined by an outstanding consort orchestra along with five magnificent soloists, and will feature our Trinity Chorale in an exquisite arrangement of the traditional French Carol Il est Né! Don't miss out on what promises to be an evening to delight, entertain, and inspire!